A student editor at a top university has been fired in a transphobia row after he tweeted that 'women don't have penises'. 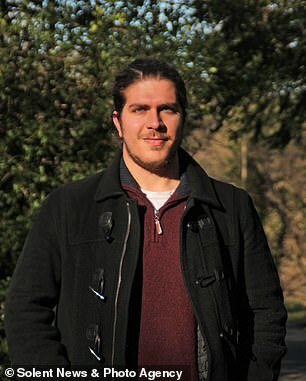 Angelos Sofocleous, assistant editor at Durham University's philosophy journal 'Critique', was sacked from his post after just three days for writing a tweet deemed 'transphobic' by fellow students. Mr Sofocleous, 24, from Cyprus, faced disciplinary action last month after he re-tweeted an article by The Spectator on his Twitter titled 'Is it a crime to say women don't have penises? ', with the comment: 'RT if women don't have penises'. The postgraduate philosophy and psychology student was dismissed from his position at the university after the tweet sparked outrage. He was also fired from his position as editor of Durham University's online magazine The Bubble, and forced to resign as president of free speech society Humanist Students. Collecting hundreds of comments, the comment has since sparked a row around Humanism, trans rights and freedom of speech. The since deleted tweet has received backlash from former chair of LGBT Humanists Christopher Ward who claimed the post was 'factually incorrect' and not 'worthy of a debate'. He wrote: 'As former chair of LGBT Humanists UK, the opposition I experienced from a number of longstanding Humanists members to trans people and trans issues was a stain on an otherwise great organisation. Standing by his tweets, Mr Sofocleous wrote: 'I may be wrong and women might indeed have penises, although I don't believe that to be the case. 'But the backlash that took place after my comments, particularly within the organisation, convinced me that, unfortunately and surprisingly, there are certain issues within the humanist movement which are undebatable. 'No effort was made, beyond name-calling, derogatory comments, and ad hominem statements, to convince me of the truth of the other side's position. 'These events involved a retweet of mine saying 'RT if women don't have penises', and certain other criticisms of the transgender movement, as well as suggestions to improve the movement's actions. 'Sadly, these views were taken to be 'transphobic' by individuals who cannot tolerate any criticism, either of their movement or their ideas, and are unable to engage in a civilised conversation on issues they disagree on. The twitter row has sparked debate over free speech. Journalist Toby Young replied to Mr Sánchez-Schilling, tweeting: 'As the editor of a philosophy journal at one of Britain's great universities, how do you justify not tolerating dissent from campus orthodoxies?